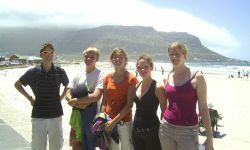 Nacel's student exchange programs in South Africa offer a great opportunity to live with a host family and study in a local high school. Like just another South african teenager! If you have an intermediate level of English and want to improve it as much as you can, come and participate in this program. 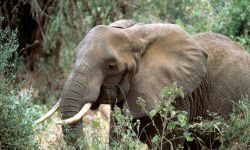 Live an unforgettable experience and discover the educational system of this country with rich culture and wonderful wildlife. What should I expect from this High school exchange in South Africa? You can attend high school for one academic year, semester or a term in South Africa. Students will live with local host families who will welcome them as if they were a new member of the family. You can participate in sports activities offered by the school. As soon as you arrive in the country, you will attend a three-day orientation session by a local coordinator who will provide you with assistance and support throughout your stay. This orientation will allow you to meet other exchange students and learn more about South Africa and the rules of the program. We will keep your parents informed of your adventures in the country. 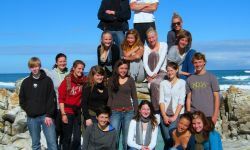 International students from all over the world study in South Africa to immerse themselves in the way of life of the local people and to become fluent in the language. 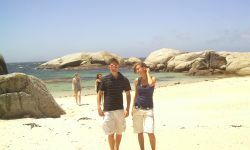 Sign up for this authentic exchange program in South Africa with Nacel International! Host family on full board. Note that students may be placed anywhere in South Africa. The academic year starts in January and ends in December. September 30th for arrival in January; April 30th for arrival in July. “During the first half-year of 2013 I made an exchange program in Cape Town, South Africa. It is not normal for a Colombian to go to South Africa, and I thought it was going to be a nice and different experience. And actually it was the best experience I could ever had. I learnt much more than I expected. I lived in an amazing host family, and they taught me a lot about their culture and about their ways of living, that actually weren´t that different to my hometown. They opened their doors for me, and they made me feel part of the family. Beside my host family I met a lot of nice people at school, where I went during the exchange. I made stronger friendships in six months than I could ever had made here in a lifetime. I met people I will never forget and I was in places I would always remember. Even though the culture is not so different as the culture in Colombia, I had a completely different life there. I went to the school walking and I lived near to the beach. I used public transport, while in Colombia I am used to get everywhere with the car. It was amazing to take the train and the taxi. It helped me to become more independent. 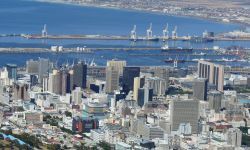 Cape Town is a beautiful and huge city. At the beginning I never thought I could ever be able to get to any place alone. But actually it was very easy to take the public transport and I had the opportunity to see beautiful places by my own. Sometimes it is sad to look back and think about the amazing people I met and left there. But I am lucky to have those beautiful memories, and I would never change this experience for anything. Someone told me once that everyone who goes to South Africa leaves a part of their hearts there. I thought he was exaggerating, but at the moment I left South Africa I knew he was right, and a part of my heart was left behind.